This just went live in the last 24 hours. Along with working on my own Gaucho Software products such as Seasonality, Dash Monitors, and XRG, I also consult for other firms. I’ve been working with Jeremy and the rest of the DynDNS team on their Mac update client for quite some time. Just recently, version 2.0 of the project has reached a stage where it’s ready for public beta consumption. The interface, developed by FJ de Kermadec and his team at Webstellung is top notch, and does a great job hiding the complexity of everything going on behind the scenes. We still have some work yet to do before a final 2.0 release is ready, but I think the app is looking pretty good thus far. The MacBook Pro uses an advanced system management controller (SMC) to manage thermal and power conditions, while keeping the acoustic noise to a minimum. The SMC is fully independent of the operating system. Making the SMC completely independent of the OS is a very good thing. Without OS independence, thermal drivers for Windows XP, Linux, or any other OS you want to run on Intel machines would have to be written. This code can be fairly difficult to write, so really the SMC will make things much easier in that respect. However, it would be nice if Apple provided a way to monitor what the SMC is doing…let the SMC do it’s job, but give me a way to find out how my machine is feeling. Update: James Conolly and Cryptonome (from the source, InCrew) both mentioned SpeedIt in the comments, which made the news a few days after I wrote this post. I have yet to look into the full details of the implementation, but it looks like there might be MacBook Pro temperature monitor support in XRG afterall. While it probably wouldn’t make sense to include SpeedIt directly with XRG, if a user has SpeedIt installed, it should be fairly easy for XRG to pick up the temperatures and display them. Yet another feature to add to the next release. Thanks go out to the InCrew folks for making this possible. Back when a G4 Powerbook was my primary computer, I had a gig of RAM and that was more than enough. So when it came time for me to upgrade and I went with a G5, I figured 1.5G would be pretty cool because it was 512M more than what I had before, which was always enough. Unfortunately, it only took a couple of months of adjusting to having dual processors and a G5 that I started running out of memory…daily even. I didn’t have to quit apps like I used to on my Powerbook to make a small fraction of CPU time available for the current apps I was using. Having dual processors is just such a huge bonus, and it’s very rare that I actually peg both CPUs, usually only when compiling. The result, memory filled up, swap started going nuts (there’d be times I would find myself using 1.25G of swap), and the machine just slowed down and kept me from getting work done. Then it was just a matter of interfacing with sysctl APIs directly from MTK and the widget plugin. Works great, and I think it will be a good addition to Dash Monitors 1.4 when it is released. Anyway, I think this will hold me off for a good amount of time. I still have 2 free DIMM slots, so I can always go for 1 or 2 more gigs, but by that time this machine will probably be getting close to the end of it’s life span. In the mean time, I’m happy and definitely enjoying the extra RAM. Dashboard Widgets has finally opened the voting for their Mac Mini Contest. Check out the widgets on their site and vote for your favorite. Dash Monitors 1.2 was released this morning. I think this release is a lot nicer than version 1.1, and it’s the first release that is considered “final.” If you are running Tiger, be sure to check it out. 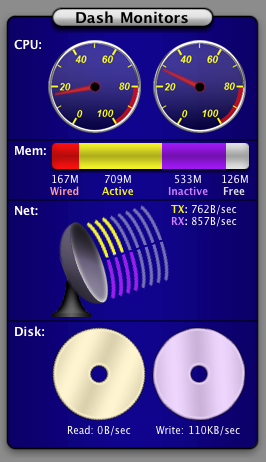 In preparation for a Dash Monitors 1.2 release tomorrow, I’ve released MTK 1.0 this afternoon. Dash Monitors 1.2 will get all of it’s statistics from the MTK app and plugins, and so far it’s working great on my machine here. I’m hoping to get some developer docs written soon, so people can write their own MTK plugins. In the meantime, all the current plugins are pretty simply laid out, so you can probably just look at any of those to pick up how a plugin should work. If you want to use MTK Plugins in your own project, check out the source code for the mtk command line executable. The MTKController class is a pretty good place to start, and the entire class isn’t much more than 150 lines of code. MTK is released under the GPL, so please respect the open source nature of the code. The archive includes a complete copy of the license. Basically, it boils down to free usage as long as your code is released under the GPL as well. Tiger is finally out, and today been great for Dash Monitors. Dash Monitors has been featured on multiple sites, and it’s currently ranked #2 in the top 10 Widget downloads on Apple’s download site (ahead of Delicious Library Mini Shelf, woohoo!). The downloads for Dash Monitors today have completely trumped any other release of XRG or Seasonality (on average, one download every 10 seconds since midnight), so it looks like the product will be a hit. The thing is, Dash Monitors 1.1 is still a preview release. I wish I would have finished 1.2 before today, but I haven’t. It’s going to be a pretty big priority to get that taken care of though. I’m working on some new images to improve the look of the widget a bit, and I’m trying to condense things down so it doesn’t take so much screen real-estate. We’ll see how it goes. If you are one of the people who has downloaded Dash Monitors, thanks for making the release a great success. Dash Monitors 1.1 preview was released this morning. Version 1.1 includes two new graph modes: text and graphical. From the project web page: The text view mode shows a very simple text view of the resources being used and is beneficial because it takes very few system resources to generate the statistics. The graphical view mode, while taking more CPU resources to draw all the monitors, displays a nice interface to what is happening on the system. Text summaries are provided with most of the monitors in graphical mode to provide the exact data along with the graphical approximations. I’m releasing this version with an expiration date of June 1. I’m sure the Dashboard environment will continue to change as Apple gets closer to a public release of Tiger, so I don’t want to offer a full release until then. Check out the preview release and post suggestions for future functionality to the Gaucho Software Forums.